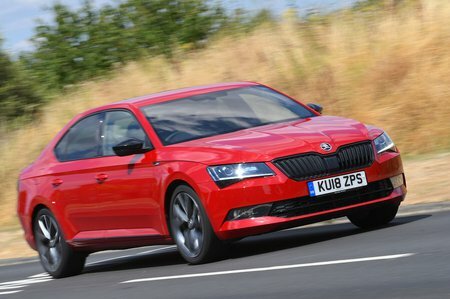 Skoda Superb Boot Space, Size, Seats | What Car? There’s a lot more room in the front of the Superb than you'll find in executive cars such as the BMW 3 Series and Jaguar XE. The wide front seats will comfortably accommodate most people, while the range of adjustments on offer mean head and leg room won't be an issue for any but the tallest. The interior is also wider than average, so there’s plenty of shoulder and elbow room. Lots of storage options are dotted around the interior, including a large air-conditioned glovebox, cupholders in the centre console and a hinged cubby underneath the steering wheel. The door bins are also large and shaped to hold a 500ml bottle of water. Thoughtful touches include a glasses holder by the rear-view mirror and, on SE trim and above, two umbrellas neatly stowed inside the front doors. Not much this side of a Mercedes-Benz S-Class will offer you as much rear leg room as a Superb – or head room, for that matter – so if you’re over six feet tall and want space to relax, this is the car to go for. Getting in and out is easy, too, thanks to the wide opening doors and low sills, and on models fitted with electric front seats, optional controls can be specified that allow the rear passenger to move the front passenger’s seat forward to make even more space available. The middle passenger is not quite so well off: they'll have to place their feet either side of the relatively high central tunnel and don't get quite as much head room. However, providing they’re not too tall, it’s still a comfortable place to travel for a reasonable distance. The fold-down centre armrest includes two cupholders and, if you specify the optional cradle, can be used to mount a tablet computer. At the rear of the centre console, there’s a hinged cubby with a 12V socket and two map pockets on the backs of the front seats. Meanwhile, each door has a pocket that’ll hold a 500ml bottle of water. 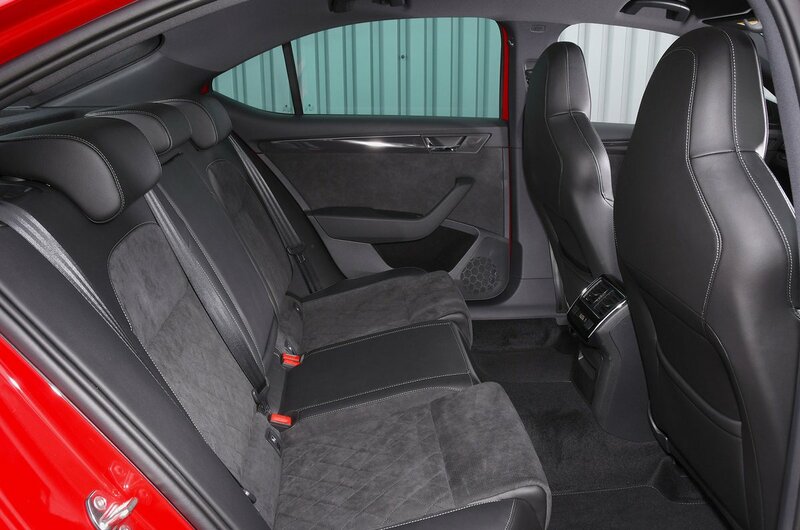 The rear seats are split 60/40 and there’s a ski hatch in the centre seat that allows long loads to be accommodated without disturbing the car’s remaining four passengers. 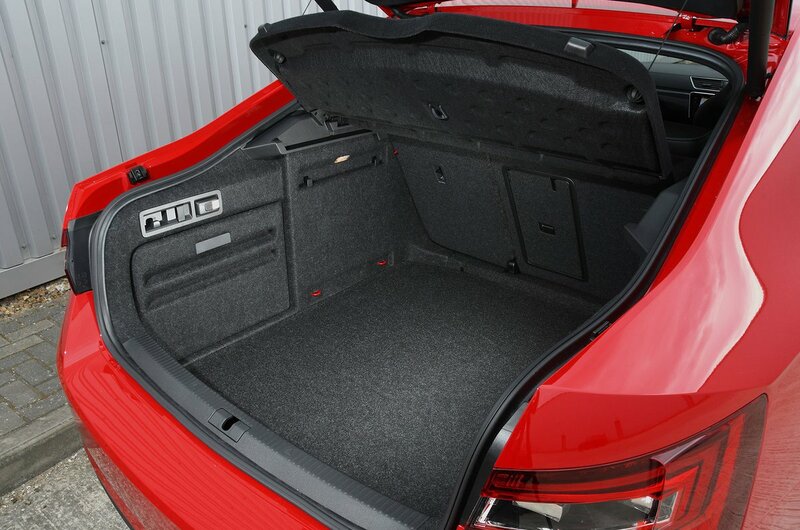 On SE and SE L Executive trims, you can order a fold-flat front seat, enabling the car to accommodate extra-long loads from the rear of the boot to the dashboard. The seats can be lowered by simply pulling a lever on the top of each backrest. Alternatively, you can specify an optional release mechanism with levers conveniently located by the boot entrance. Unfortunately, when the seatbacks are folded down, they leave a step in the extended load area that makes the loading of long, bulky items that bit trickier. Even with the rear seats in place, there’s enough room in the Superb’s boot for a number of large suitcases and the volume on offer is truly exceptional. Because it’s a hatchback with a wide opening tailgate, it’s easy to load big items; you don’t have the narrower boot apertures associated with saloon cars such as the Volkswagen Passat to contend with. That said, there is quite a big lip at the boot entrance and there’s no variable-height boot floor. Helpful touches that are standard on all models include a number of carrying hooks to hang shopping bags on, a large cubby either side of the main boot area, a 12V charging socket and a rechargeable torch. You also get two plastic dividers with Velcro feet that can be attached anywhere on the boot floor to help wedge a loose item into a corner. A boot net that allows you to tie down loose items is standard on SE L Executive and Laurin & Klement trims, and an option on all others. An electrically operated bootlid is standard on SE L Executive, Sportline Plus and Laurin & Klement trims, and is an option on SE and Sportline. With it fitted, you can also specify the Virtual Pedal, which allows you to open the boot by waving your foot under the rear bumper – this is standard on Laurin & Klement.